During the Legacy Build the Fuller Center is partnering with SEND in the St. Paul community. Learn more about the work of SEND here. A walk down St. Paul Street from Prospect Street south to Pleasant Run Parkway is a quick lesson in the decline and fall of urban America. It’s plain to see that this street has suffered the effects of disinvestment and neglect for many years. Most of the houses were built here as rental property over a century ago. They share a similar style and scale that still commands a certain respect even in their current poor condition. At first the street must have looked great with its rows of two-family houses set high up above the sidewalk, all featuring deep porches and flanked by low masonry retaining walls. Back then most of the people living in the area were employed by nearby industries. They walked to work, or took the Prospect Street car. They patronized neighborhood groceries and attended the local churches. The Indianapolis city planners provided a tree-lined parkway along the stream called Pleasant Run at the south end of the neighborhood. Pleasant Run Parkway connected the southeast side residential neighborhoods to Garfield Park, the City’s largest and most beautiful public park. St. Paul Street must have been a great place to live. But over the years the factories closed down and jobs disappeared. The past 60 years have brought economic stress and social changes that have eroded neighborhoods all around the city. This neighborhood seems to have fared worse than others. Today most of the old two-family houses are empty. Some have been burned or demolished. The remaining structures are ramshackle and forlorn. 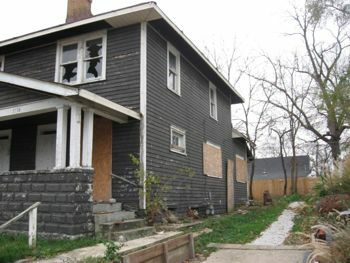 Most people think the sad state of things on St. Paul Street is due to the fact that the people who lived there never owned those houses so they just didn’t care. When things got tough, the neighborhood went down hill fast. SEND has been working over 25 years to change all that. Our mission is simply to improve the quality of life for residents of the southeast side. With our arsenal of housing and economic development programs we fight blight and poverty. It’s hard work and we can’t do it alone. That’s why we love to have others join us. A grand project like the Fuller Center’s plan to build nine houses on St. Paul Street is a real godsend. The 2010 Legacy Build is an inspiring project and inspiring projects motivate people in all kinds of ways. Many people will give money and many people will come here to work for a week or more. The people who live here now and those who hope to live in the new Legacy Homes will want to be involved as well. They have a greater stake in all this. One of the things we have learned here on the Southeast Side of Indianapolis is that building houses and building community are two different things. Building houses for families will bring new hope to this neglected area, but in order for this project to have lasting benefit we must uplift the whole neighborhood and restore the feeling that St. Paul Street is a great place to live. That’s what SEND is here for. We can connect the Fuller Center with neighborhood leaders who will make their enthusiasm and passion for this community a fundamental and lasting part of the Legacy Build. We can ensure that the residents of this area have the opportunity to participate in the Legacy Build in a meaningful way through home repair projects on St. Paul and the surrounding streets. We can call on our local partners to engage in projects to improve the streets and sidewalks and reconnect St. Paul Street to the natural beauty that was such an important part of this neighborhood. When you call upon people to get involved you empower them. Empowering neighbors strengthens old ties and forges new relationships. When people work together they learn to depend on one another and to care for one another. In this way the Fuller Center project will build more than houses on St. Paul Street—it will build community. Learn more about the Legacy Build here. Consider donating now to the miracle on St. Paul!